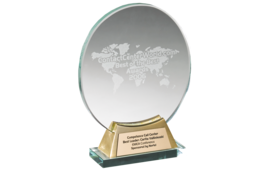 On August 31 st , the award for the Best Call Center Manager of the whole EMEA economic area (Europe, Middle East and Africa) was presented at the World Contact Center Awards. Carita Vallinkoski was able to take this international award home to Vienna. She convinced a 26 member international jury with her management services in CCC locations in Vienna and Bratislava.The Finnish-born manages both those offices and leads over 600 employees. She has been a leading figure in the call center branch for 12 years. Ms. Vallinkoski received this award both for her management services in the call center business and for her strategic leadership of employees. With the training concepts she developed and her professional project management, Ms. Vallinkoski sets the standards for the whole branch. Employee motivation and lasting training measures mark the leadership style of the longstanding call center manager, who has taken on a pioneering role for the branch – far beyond the borders. « Outstanding personalities deserve outstanding awards. As a great person and her years of branch know-how, Carita Vallinkoski has given the best for her team and her clients every single day. This unique personal development has led from the « Call Center Manager Award » for Austria in 2001 to the « Best Leader » of the branch for the whole EMEA economic area. Carita Vallinkoski is a model across all branches, » Thomas Kloibhofer, CEO of Competence Call Center AG, is convinced. « The best thing in life for me is to do something I love with all my heart and dedication. I love the CCC company, my challenging tasks, the very exciting call center branch, our clients and partners and above all the heart of every call center – our employees. I really wanted to take this award home, as a sign, a thank you and as a respectful recognition of the many wonderful services that have made this award possible. I am especially delighted that the dedication, service, competence and passion of every single CCC employee is rewarded. This award conjures such a proud smile on the faces of our employees. This gives us strength for our next tasks and projects, » says prize-winner Carita Vallinkoski. 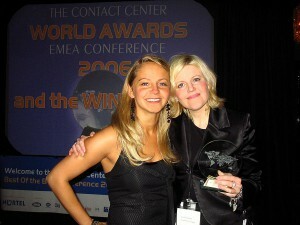 The winner presented the award « Best Call Center Leader » at the Contact Center World Gala in London. With this award, Ms. Vallinkoski will take part in the world finals, which will take place in early November in Las Vegas. « I promise to give worthy representation of CCC and our employees in Las Vegas and to give it my best, » concludes the winning Call Center manager.